"Calm the mind; clarify the thought"
"Real Kung Fu comes from the foundation. Magical hands (techniques) come from hard work." 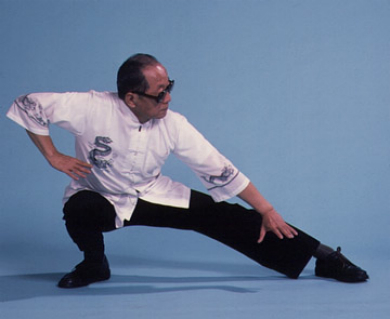 "Practice Kung Fu with agile arms, legs, and body. The ultimate goal is to be agile with your mind." "If a practitioner’s style is without softness, then their composure lacks magnificence and openness. If a practitioner’s style is without hardness, then their composure lacks fierceness and chi. (Within softness, there is hard. Within hardness, there is soft.)" "I believe everything and doubt everything. To believe is to accept with an empty mind. To doubt is to investigate cautiously." Confucianism: With sincerity in one’s mind, one can cultivate the individual, and rectify one’s heart, to be able to support the needy and engage with society. Buddhism: You must be focused to be able to take pain and hardship, and grasp generosity and compassion. Daoism: A trait of Daoism, is to be naturally developed. To look at purity (the natural spirit of no thoughts or action)." 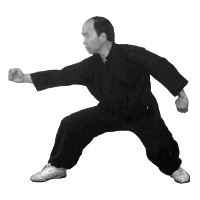 "If one does not endeavor to understand Chinese culture, it will be difficult to reach a high level of skill in Chinese martial arts." • A stable mature attitude. • To be calm and sink your chi. • Accuracy will control timing. • To be sharp/to the point and fierce. * "The ability to 'Let Go' is the highest level of achievement." "Beauty or the lack thereof is determined pre-birth. The most important thing is to develop character and demeanor within ourselves. Demeanor represents a person’s character and integrity. Career, fortune, and future follow its development." • For Buddhism: the cultivation of chi, for the ability to contemplate emptiness. • For Daoism: the practice of chi, to return to a natural state. • For Confucianism: to balance/neutralize chi, for the ability to return to being a sage. • When business matters arise, use your heart and your mind to deal with them. When the matters are solved, your heart and mind can let go.